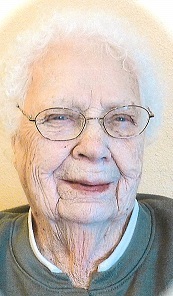 Irma Dora (Doering) Marquart was born on May 30, 1916, the only child of Margaretha Doering in Deshler, Nebraska, and passed away on Wednesday, November 14, 2018 at the age of 102 years, 5months and 14 days at the Blue Valley Lutheran Skilled Care Facility in Hebron, Nebraska. She was raised by her grandparents John C. Doering and Sophia (Schlamann) Doering on the family farm rural Ruskin, Nebraska. Irma was baptized on June 30, 1916 at Zion Evangelical Lutheran Church, rural Deshler, Nebraska by Pastor Lentz. She attended school District 92, rural Deshler until 8th grade. She was confirmed in German on June 22, 1930 also at Zion by Pastor J. A. Grueber. Since her mother was the oldest Doering daughter she always considered her uncles and aunts, her brothers and sisters. She talked often how she would get to help her Grandpa John, even going to Beatrice with him once and they ate in a restaurant, she could tell you what Grandpa ordered for dinner. She said it was the best food she ever ate. She helped Grandma by babysitting and loved to go to Ruskin on Saturdays and watch free movies. Irma was united in marriage to William J. B. Marquart on May 30, 1935 at Zion Evangelical Lutheran Church by Pastor J. A. Grueber, and celebrated their 40th wedding anniversary in l975. They lived on a farm near Ruskin until 1949; when they moved to the Ernst Marquart family farm rural Byron, Nebraska. While Bill farmed, Irma took care of her in laws until their passing. Bill and Irma were blessed with four daughters, Merna, Janet, Alice and Nancy. Irma raised a lot of chickens. They also had milk cows in the early years of their marriage and sold the milk. As the girls grew, Irma became Bill's helper in the fields, and continued that until Bill had a farm auction. In 1936, they attended a farm auction near Cadams, Nebraska and purchased a Singer Treadle sewing machine for $7.50. She had saved her egg money to buy it. There wasn’t much money left for groceries that week. Over the years she made crazy quilts and 9 patch tied quilts for her daughters, grandchildren and great grandchildren. She made baby quilts, name quilts, college quilts and wedding quilts for her grandchildren. Many other family and friends received her baby quilts. Irma continued to live on the farm, her dog, Mopsy became her best bud waking her in the night to shoot some animal he had up a tree. She loved her “ kitties” and the kids or grandkids “Poochies”, never calling them by the pet’s name. She was always the pitcher for the family ballgames. She taught her family how to play cards. She had homemade bread, candy bars and pop waiting when the grandchildren came to visit. She had a homemade wagon that she attached to the riding lawn mower to give the little ones rides. She was a very hard worker all of her life. She painted the outside of many houses, barns, and other outbuildings in the area. She also wallpapered and painted interiors of homes, Churches, the Thayer County Courthouse just to name a few. She was not afraid of heights and taught several women the proper way to paint as well as her daughters. She drove to Lincoln to teach Nancy and Ken how to shingle their house. The Christmas sleepovers at her house were 20 or more people sleeping on the floor telling stories, and giggling. Not much sleeping took place but precious memories were made. Irma traveled on many bus tours. She watched the KC Royals baseball team and even attended a game or two. She went to visit her grandsons in Germany twice, and even went to Hawaii. Irma took up bowling on Wednesday afternoons and bowled for over 25 years. She belonged to the Byron Senior Center, WELCA , and helped with world relief sewing days. She played ten point pitch cards with several groups, everyone wanted Irma as a partner, as she would usually win. In 2002 Irma purchased a home in Hebron. In 2011 she moved to Courtyard Terrace. She liked the fact she no longer had to cook, clean or do laundry and could continue to make quilts. She moved to Blue Valley Lutheran Skilled Care Facility on December 12th 2014. She enjoyed the activities there but loved cards the most. She was the fastest at word search puzzles, fixed jig saw puzzles and always won at cards against her daughters. She is preceded in death by her husband Bill, on March 4, 1976, mother Margaretha, step father Henry Steinman, Grandparents, infant half-brother, sons in law, Warren Kennel and Jerry Vieselmeyer, infant Great Great granddaughter. She is survived by her daughters Merna Yoder, of Aurora, NE, Janet Kennel, Geneva, NE, Alice Vieselmeyer, Friend, NE, Nancy Vogel and husband Ken of Hebron, NE. Grandchildren, Michael (Bridget) Yoder, Henderson, NE, Monte (Kelly) Yoder, Aurora, NE, Randy Kennel, Geneva, NE, Joni (Ron) Nuss, rural Aurora, NE, Karl (Angela) Vogel, Lincoln, Jack (Karen) Vogel, Lincoln, NE, Rena (Lynn) Scheets of Fairbury, NE, Ray Vieselmeyer of Orem, Utah, and Darren Vogel of Hebron, NE. 20 Great Grandchildren, One Great Great Grandson, nieces, nephews and other relatives.